Find tourist attractions and things to do near Gulf Shores Fishing View Map. We are all about fun and fishing on the Getaway. Family fun Getaway Charters has been offering some of the finest Alabama deep sea fishing in Orange Beach and Gulf Shores for over 14 years for the family and you experienced anglers. We fish fall, winter,spring and summer. Orange Beach, Alabama Light Tackle Fishing Distraction Charters is a charter fishing company located in Orange Beach. We specialize in "private" family fishing trips. We carry a maximum of 6 passengers. We are a family friedly deep sea charter fishing service We are the premiere deep sea charter fishing service for Orange Beach and Gulf Shores, Alabama. Since 1996, we have logged hundreds and hundreds of charters and provided many exciting sport fishing opportunities to thousands of satisfied clients. Foley Convention & Visitor's Bureau promotes Foley as a vacation destination. The Foley CVB is instrumental in bringing new visitors to the area. Hot air ballooning along the Alabama coast is a wonderful outdoor activity to be enjoyed by the whole family or for a special romantic event. Come enjoy the beautiful view today. Reservations recommended. Inshore, Offshore, and Nearshore Charter Fishing Inshore, offshore, and nearshore fishing aboard the charter boat Ni-Cole. We fish for redfish, mackerel, sheephead, trout, snapper, grouper, amberjack, tuna, mahi, shark, and other speices. Trip Advisor's #1 Florida Gulf Coast Attraction & Museum The National Naval Aviation Museum features nearly 350,000 square feet of displays and is one of the world’s largest aviation museums. Exciting visual displays and fun interactive exhibits highlight the wonders of Mobile's estuary system. We've got all there is to ""sea!"" All ages welcome. Admission charged. Please join us aboard the Mobile Bay Ferry - The Gulf Coast's Most Scenic Drive! Offering daily vehicle/passenger service from Fort Morgan to Dauphin Island. Visit our web site for rates, schedules and details. Owned and operated by Hornblower Marine Services - Alabama. Prices per person and large and small private charters Prices start at $130 per person to join a group and deep sea fish with more people. We also take small and large private charters deep sea fishing. Inshore / bay fishing can take 1-4 people. Licenses are included. Bring your food and drinks iced down in a cooler. Large and small fishing charters, walk-ons and party boat - per person and group prices. PRICES STARTING AT $90 PER PERSON. Located on Dauphin Island south of I-10 on Hwy. 193 just as you get off the Dauphin Island bridge. Join us for a relaxing nautical adventure aboard the ""Duke"". Choose from inshore fishing trips, lighthouse cruises, dolphin-watch cruises or sunset cruises. Call for reservations. Action Outdoors Entertainment, L.l.c. Segway tours and bike rentals in Downtown Pensacola Emerald Coast Tours offers Historical Tours of Downtown Pensacola by Segway or bicycle. Bicycle Rentals and Historical Walking Pub Tours are also available. 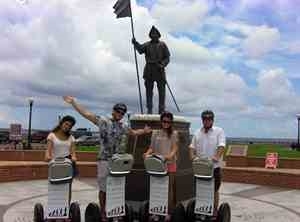 1hr Segway tour with a stop at a free wine tasting. What better way to start your night out than with a 1hr Segway tour and a wine tasting? Yes, it's as fun as it sounds. Located at world-famous Bellingrath Gardens, 150-passenger 'Southern Belle' offers 45-minute fun and informative sightseeing cruises. Dinner cruises operate Friday and Saturday nights, Feb.-Nov., nightly in December. Pre-paid reservation required. Being that this vessel is full fiberglass and wood free. The Wave Cutter has the strength of a commercial boat and all the amenities of a luxury sport fisher. Some of the most unique historical and natural sites to be found in the Mobile-Tensaw Delta are covered by Five Rivers Delta Safaris' pontoon boat, Hovercraft and deep delta waverunner safaris. A must-see for visitors to the Mobile Bay area! Airboat rides and tours in the Mobile Delta. Custom made, state of the art Panther Airboat seats six. Very comfortable seats. Three passenger minimum. Trips depart from the Original Oyster House in Spanish Fort on the Causeway. Reservations welcome.